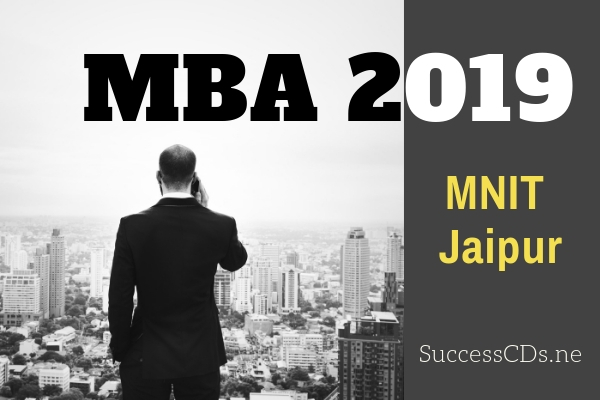 MNIT Jaipur MBA Admission 2019 - Malaviya National Institute of Technology (MNIT) Jaipur invites application for admission to Master of Business Administration at Department of Management Studies for the academic session 2019-20. Candidates can check the complete information of MNIT MBA Admission 2019 like application process, eligibility criteria, selection process etc. through this page below. MBA (Master’s in Business Administration): A two year full‐time Postgraduate degree in Management. PhD in Management: A rigorous doctoral program focused on conducting world class research in business, management and related areas. The program is offered in both regular and part-time mode. The two-year full-time MBA Program offered is spread over two academic sessions each comprising of two semesters - the ODD semester (commencing usually from the month of July every year) and the EVEN semester (commencing usually from the month of January every year). Applications are currently invited for Academic Session 2019-20. The minimum duration to graduate from the program is 2 years (4 semesters). Candidate should have a bachelor’s degree in Engineering, Science, Commerce, Economics, Business Administration, Architecture, Pharmacy, Agricultural or Computer. Applications or master’s degree in Physics, Chemistry, Mathematics, Economics while scoring minimum CGPA of 6.5 on the 10-point scale (60% marks, only where CGPA is not awarded) with a relaxation for SC/ST implying minimum of 6.0 on the 10-point scale (55% marks, only where CGPA is not awarded). Candidate should have appeared in any of the management admission tests: CAT, GMAT, XAT, CMAT, MAT. In case candidate has appeared in more than one of the above admission tests, only one of scores is admissible. Total sanctioned annual intake for MBA program is 66, with reservations for various categories as per Govt. of India policy. Selection process for admission to the MBA Program commences during the month of February every year for the forthcoming academic session. Institute invites ONLY online applications from the eligible candidates interested in joining the MBA Program. The Dept., after receipt of applications invites the candidates, who shall be fulfilling the specified minimum requirements, for GD and PI to be held in two rounds (in May 2019 & June 2019) only aDept. of Mgt. Studies, MNIT, Jaipur as per the notified schedule. Admissions being offered will be made to the ODD Semester of Academic Session 2019-20. The candidates are shortly advised to reach, and every instruction given to this information brochure very carefully before filling-up the Application Form. Candidates can apply online www.mnit.ac.in. Application form must be online on the link given on the MNIT website after payment of application fees online (Rs.2000/- for Open /OBC category and Rs.1000/- for SC/ST/PH category). Application Fees is non-refundable under any circumstances. Affix the photograph at the designated place on the print out of the application form before dispatching. The duly completed application should be sent to the Head of the Dept, Dept of Management Studies, Malaviya National Institute of Technology, JLN Marg, Jaipur, Rajasthan-302017. All Attested photostat copies of the certificates/testimonials must be enclosed with the Application Form. In no case, the original certificates/testimonials should be enclosed with the Application Form.